The preview season for Shadows over Innistrad is in full swing, and so far we've seen some exciting cards! New Jace! New Sorin! Avacyn has flipped out, and Nahiri blew up Markov Manor! We get another Double-Faced planeswalker in Arlinn Kord, and have some pretty cool cards like Thing in the Ice, Brain in a Jar, Westvale Abbey and Harness the Storm to brew with. I personally look at cards through the eyes of a Modern player. I may not play much Standard anymore (though, Eldrazi ramp is a lot of fun!) but I do play a lot of Modern. Of course the format is in flux, players know a ban is coming, but no one is really entirely sure what is going to get removed from the format, and while we wait on the announcement, Eldrazi have overwhelmed the format. With rotation coming up in Standard and a banning happening in Modern, Flashback drafts sure have been a super distraction! Anyways, I am going to look at our preview card today through the eyes of a Modern player. You all ready to see it? Ok good, here it is! Ok, there it is, Tsunami of Tentacles. Watch out for it in packs of Shadows over Innistrad! Ok that was not the best joke, I'm sorry, here is the actual card as it appears in Shadows over Innistrad. Engulf the Shore is card I am excited to see! At four mana, in a mono blue deck, you're going to be bouncing a lot of threats in Modern! Thought-Knot Seer, Eldrazi Mimic, Endless One, (Eidolon of Great Revel), Vault Skirge, Kitchen Finks, every elf, Goblin Guide and an almost endless amount of other threats are returned to their owner's hands. Cast in the combat phase this card can act like a Fog as your opponent's creatures are bounced from the battlefield back in to their owners hand. Cast at the end of turn, this card is could be more seen as a Time Warp. The instant speed that this card can be cast really makes it stand out in my opinion! What Modern deck would want Engulf the Shore in it though? Well, Merfolk is a primarily a mono blue deck, but it is a creature based deck. Returning all your fishy friends to your hand would be pretty ok in a few situations, namely ones where your opponent is casting Anger of the Gods, Firespout, Supreme Verdict or Pyroclasm. In merfolk, this might be an ok sideboard card. A deck like Blue Moon might be able to take better advantage of this card though. Blue Moon looks to use Blood Moon as a way to disrupt the nearly perfect mana bases of Modern, and plays a control role throughout the game. If you can overwhelm them before the Blood Moon comes into play, they would need a reset to get back in to the game. Engulf the Shore would fit in rather well there I think. Ten Islands makes this a rather risky card to have in the deck though. 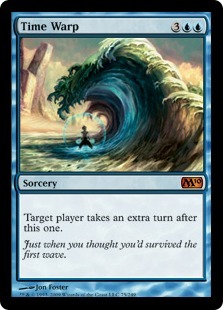 Mono Blue Tron would be another deck where I could see Engulf the Shore making an impact. While the deck has access to Cyclonic Rift and Oblivion Stone another problem solving card may not be the worst thing for it. Of course, having only eight Islands in the deck makes this kind of risky as well. I personally would test this in place of an Aetherize out of the board. So far the blue decks that I have suggested have not really excited me for the card. However, that may be because of the amount of Islands in each deck. Merfolk has about ten. Blue Moon has about the same, thanks to Steam Vents, and Mono Blue Tron runs eight. I want to take full advantage of Engulf the Shore. I want to end of turn cast this spell, returning all of my opponent's creatures, reducing them to lands and a fully stocked hand. What deck in Modern could take best advantage of Engulf the Shore? Well I think this one could make a positive impact in the main deck and sideboard, and after spending the last month or so playing it, Engulf the Shore would be a welcome addition to the deck. Taking Turns has been my deck of choice in Modern for a while now, it's cheap for a Modern deck, coming in at around 150 tickets for the full deck. It's fun, because casting Howling Mine effects, drawing a ton of cards, and locking up the game through extra turn spells is a blast. We would get to take full advantage of Engulf the Shore, because unlike the other Mono Blue decks in the format, this one runs twenty islands! Of course, Engulf does not play well with an awakened Part the Waterveil, but by the time the game gets to that point, you should not be worrying about casting Engulf anyways! With that said, Engulf the Shore is a pretty cool card, and it's something I am looking forward to casting in Standard and Modern. Prereleases for Shadows over Innistrad start on April 2nd for paper, and April 15th on MTGO, with the set releasing on MTGO on April 18th! This card is pretty cool. I can't see it seeing a lot of Modern play but it is interesting. Personally I like pairing Engulf the Shore with Snapcaster Mage. Bouncing all their creatures end of turn and getting your Snapcaster Mage back in hand is a pretty sweet deal. You could then even Snapcaster the Engulf a few turns later after they've replayed all their creatures. It could also work nicely with cards like Vendilion Clique. That said this is a bit slow and durdly. I like the idea of using it in the Taking Turns deck too.